A sectarian outburst by the DUP leader Peter Robinson has disgusted nationalists and escalated the sense of crisis in the North’s political process. Robinson sparked uproar on Monday when he accused a rival unionist of “selling land to republicans”. The Six County First Minister accused the TUV leader Jim Allister of hypocrisy in criticising his dealings with Sinn Fein while he “secretly... as executor of a will is selling land to republicans in County Fermanagh”. Allister was also outraged at the suggestion that he had passed land into Catholic hands, a practice considered taboo in hardline unionist and loyalist communities, especially in rural border areas. His demands for the comments to be retracted were drowned out as the Assembly chamber erupted. The unionist extremist said an in-law had bequeathed a farm to a group of relatives including his wife, but insisted he was “neither the executor nor a beneficiary” of the transaction. Issues around control of land and property were a key grievance of civil rights protesters in the 1960s, but date back as far as the late 18th century, and led to the formation of the Orange Order in 1796. Despite Mr Robinson’s assertions, it later emerged that the Catholic family who purchased the land in the mainly unionist village of Brookeborough have no political connections. The SDLP’s Alex Attwood said that if Mr Robinson was urging people selling property to vet the buyer’s identity then that was “narrow-minded and sectarian”. As the controversy expanded, Gerry Kelly, Sinn Fein representative for North Belfast, admitted that Stormont was now in crisis. 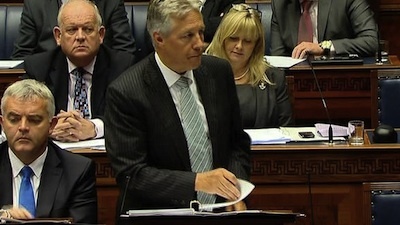 He said that Robinson’s relationship with Sinn Fein Deputy First Minister Martin McGuinness was “not workmanlike”. “We are in a crisis,” he said. “We are in partnership government. That hasn’t been manifested, especially in the office of the First Minister and Deputy First Minister, and in the relationship between the First and Deputy First Ministers. Sinn Fein President Gerry Adams TD also criticised the lack of political leadership by Robinson. Speaking in Dublin, the Sinn Fein leader said he privately briefed 26-County government officials on the difficult summer marching season and other issues facing the Six Counties. “These have not been good months for the political process,” he said. “It is clear that there is a crisis within political loyalism and Unionism. We have seen months of organised sectarian violence on the streets of Belfast. He also said the interventions of the British Direct Ruler, Theresa Villiers, were “most unhelpful”. “Obviously, we have to do a great deal of work to encourage unionism in all of its manifestations to be part of this process for change,” he added. But Robinson insisted the Stormont institutions were stable. “There are no alternatives for the people of Northern Ireland. We have to move forward,” he said.